When I was training we spent a lot of time making the classics, perfecting them. And rightly so. When done well these cakes, that you have heard of from your tiniest childhood, have their place in bakers and patisserie windows for good reason. They have a certain something, a combination that can at once contrast, accentuate and compliment. We also spent a huge amount of time making Bavarois … oh the torture of the things, and I am telling you right now (Mr Carter and Mr Dobbs) I have never ever in any establishment at any time been called upon to make one. But really I blame Escoffier (feel very naughty writing that hehe). We were aiming for Haute Cuisine. I am very lucky to have had a chance to learn such things and then off I go and play about with the recipe and make something that is still the classic but with (what I call) knobs on! With this recipe I add a lot of very dark chocolate and some apricot conserve into the batter before baking and finish it with cream cheese as part of the filling. 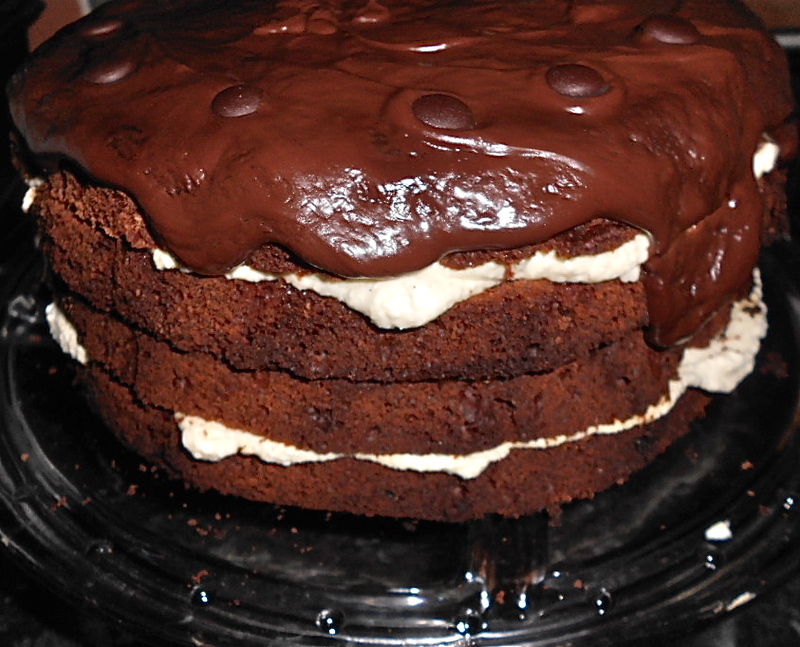 I like the way the very dark, sweet chocolate cake melt in with the vanilla cream cheese as you eat it. I have served this as a supper party pudding but it is so lovely on a sun dappled, breeze freshened afternoon in the garden with friends and a large pot of something refreshing. This is a big cake, if you want to make it smaller you can quarter the amounts and cook the cakes in 2 x 15 cm/6″ sandwich cake pans. Pre heat the oven to350˚F/ 180˚C or Gas 4. Line 2 23cm or 9” deep sided cake pans with greaseproof paper, give it a little spray with oil. Melt together the butter and apricot conserve. Once melted add the chocolate and mix until that is all melted. Add the eggs and give it a good whisk. Sift in the salt and flour and fold carefully. Pop into the oven and bake for 35 minutes, or until the tops look glossy and spring back when pressed lightly with a finger. To make the ganache, pour the cream into a medium sized pan over a medium heat and allow it to come just to a simmer (bubbles breaking right at the edge of the pan). Remove from the heat. Tip in the chopped chocolate and carefully and gently use a spatula (or a wooden spoon) to stir until all the chocolate has melted into the cream. Set it to one side to cool to just warm. For the cream cheese frosting, (please make sure the cheese is at room temperature) just tip the cheese into a mixing bowl, sift in the sugar and add the vanilla and starting slowly start to mix, ending with giving it a glorious beating! Once they are done allow the cakes to cool in the pan for 15 minutes, then turn them out, carefully remove the paper and allow them to cool fully on a rack. Once they are cooled use a large knife to split each cake in two. So now you have 4 rounds of cake. I like to place the first cake layer onto the serving plate and use half the cream cheese mix to spread over its top surface. Add another cake layer and spread with half the apricot conserve. 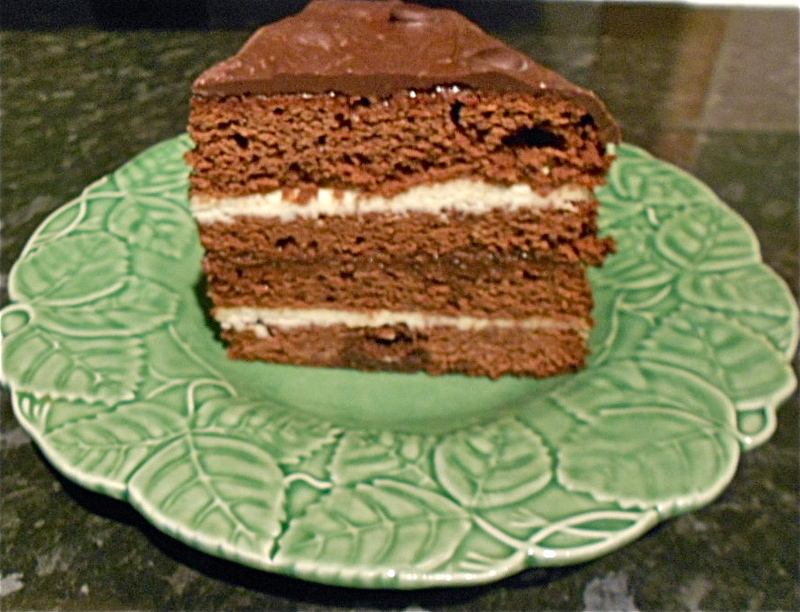 Another cake layer, the remaining cream cheese. 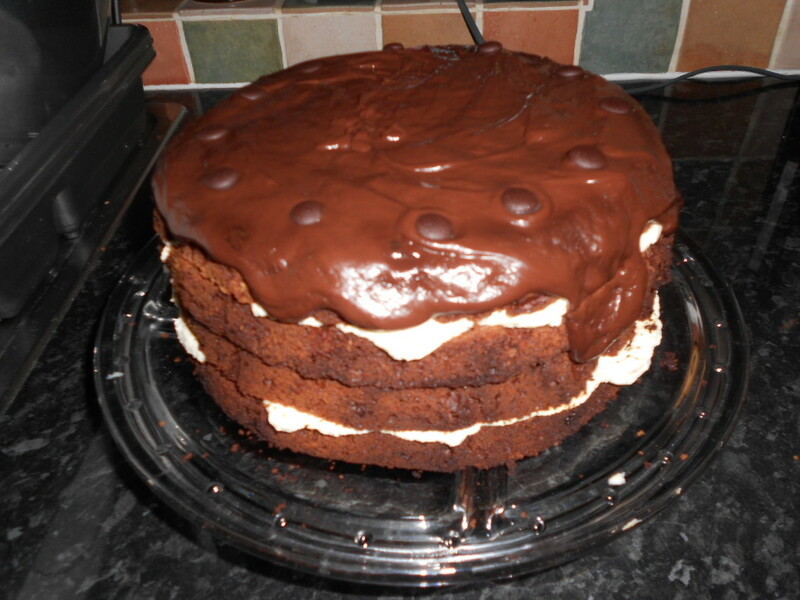 The final piece of cake, add the conserve and spread and then add on the lovely topping of chocolate ganache. Pop it into the fridge to firm up for an hour or two. When you want to serve it take it from the fridge for 20 minutes to allow it to take the edge of the firmness of the ganache and also to allow all the flavours to sing out, sometimes a through chilling can mute the flavours, and this is subtle and delicious and worth the effort.